Sweets are a treat that most people enjoy; pie being at the top of the list for many. What’s not to love about a beautiful crust covered with a delicious filling then possibly topped with some other yummy goodness or another crust? Can you think of anything? Well, besides maybe the calories. As much as I love a warm, homemade pie sometimes I just don’t feel like doing all the work. It’s times like those I’m happy to head to the grocery store to pick up a thaw and eat pie like those from Edwards. Edwards has a nice variety of pies readily available and they just added 3 more to their selection. That’s right, new flavors of Mounds Coconut, Banana Creme, and Salted Caramel have joined the ranks of rich, creamy goodness offered up by Edwards. Sadly for me I could only find the Salted Caramel pies in my grocery store, but I’m still waiting for the other 2 to hit the aisle! I’m not sure which I’m most looking forward to – the Mounds Coconut or the Banana Creme. Edward’s older Banana Cream Pie is one of my guilty pleasures. Seriously – I could (and have) eaten one by myself. On the other hand Mounds Coconut? Drool much?! The Salted Caramel pie is definitely something to keep me happy until the other 2 newbies come to my store. Salted Caramel is one of those treats that turns the worst day into something great. Edwards has taken that delicious salted caramel and covered a graham cracker cookie crust with it. On top they put a vanilla bean creme filling, chocolate covered salted pretzel bits and chocolate drizzled in perfect proportion. Stop drooling, you’ll short circuit your keyboard! I’m sure you see why I’m happy to wait for the new pies to come, I have something delicious to keep my tastebuds smiling. You can bet, though, that as soon as the Mounds Coconut and Banana Creme Edwards Pies show up I’ll be picking them up too. 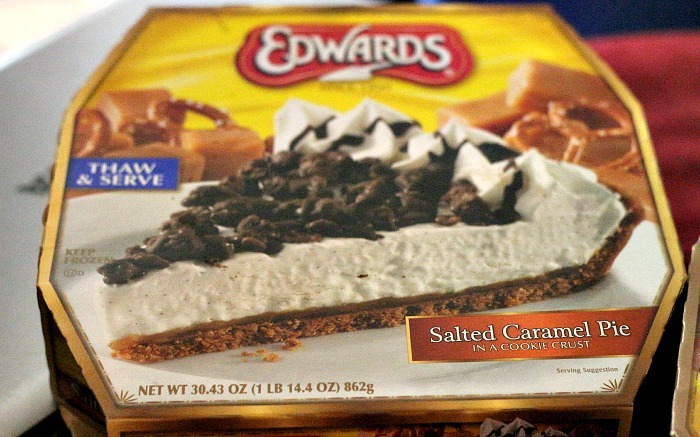 You can find the new Edwards Salted Caramel Pie and other new pies in your frozen food aisle. Find a store near you using the “Where to Buy” page on the Edwards website. You can also connect with Edwards on Facebook & Twitter! 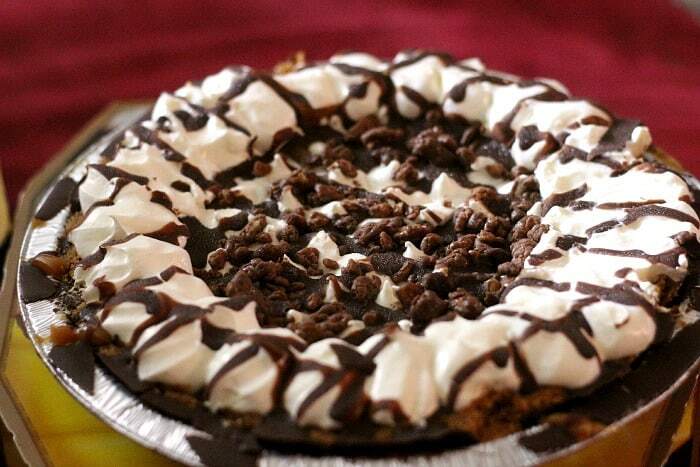 I have a coupon to give away for one of you to try a new Edwards frozen pie for yourself! Just use the for below to enter. Whether you love being in the kitchen or just go in there to make a sandwich you’re going to love this. As a Good Cook Kitchen Expert I get to tell you about all kinds of Good Cook Kitchen Products that are designed to make being in the kitchen enjoyable. 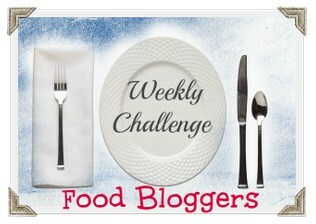 Another perk is I get to offer you the chance to try the same item(s) I’m trying! Pretty sweet, right? One of these is The Good Cook Treasure Hunt that’s coming up on April 16, 2013 – just weeks away. $1,000 of Good Cook Prizes are going to be given away and entering will be so much fun. Think virtual scavenger hunt – fun, right?! I’ll be telling you all about The Good Cook Treasure Hunt soon. I’ve got a couple Good Cook Touch gift packs up for grabs that 2 of you will be winning. 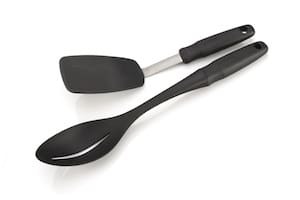 Each prize pack includes a Good Cook Touch Flex Turner and Touch Slotted Spoon. To make entering and choosing a random winner as easy as possible we’re using the Giveaway Tools form. Just enter your name and e-mail and complete any of the simple entry options to enter. 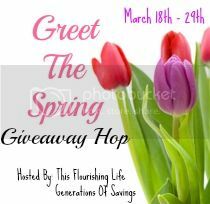 We’ll be announcing the winner on the widget as well as sending them an e-mail on April 11, 2013. Be sure to check back when we have more details about The Good Cook Treasure Hunt! As a member of the Good Cook Blogger Outreach Program I receive occasional products to review. All opinions and thoughts remain my own. If you think it’s difficult to find a cookbook for a woman, imagine how hard it is to find one tailored for a man! 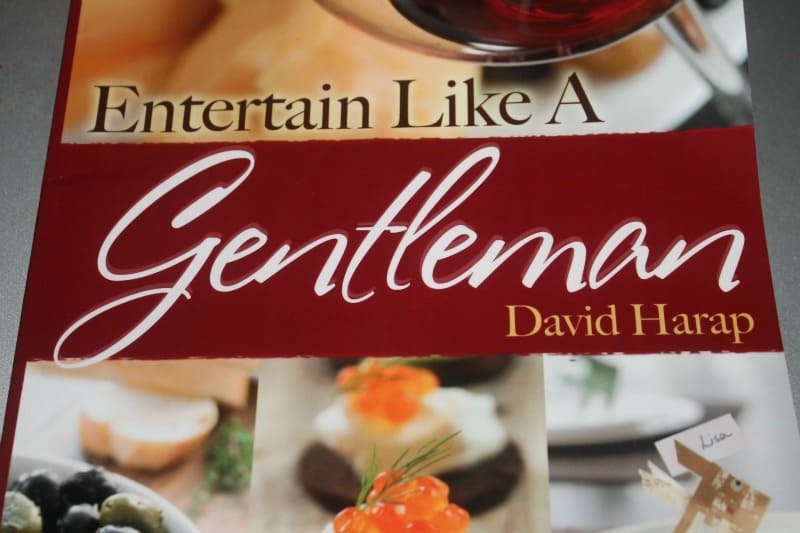 David Harap has written the “Entertain Like a Gentleman” written for men who would like to learn to make unique “classy” foods for their families or even their friends. Think of your husband making his own amazing food for Game Night, Poker Night, and any other “guy’s” night!” That means you’re off the hook and can go read a good book, take a bath, play with your kids or whatever else; the possibilities are endless! No more breathing in stinky cigar smoke, listening to them talk, or any other horrible man behavior! There are recipes that can be made ahead of time so that he can spend time with his guests, as well as those that will take up more of his time when he feels like making a great dinner for family events and gatherings. You know, when he wants to try to wow everyone with his awesome kitchen skills. Not every man can cook, but this book hopes to change that. Harap paid his way through college by being a chef, and enjoys sharing the lessons and recipes that he’s learned throughout the years. Things like shopping ahead, keeping basic items stocked in your pantry, and clean as you go. If your husband wants to learn how to cook, or wants to learn some great new recipes to share with everyone, this would be a great starting point. John has actually had a lot of fun looking through the book and trying different recipes. He scoffed a bit at first because he doesn’t consider himself to be a gentleman. Then he saw Oktoberfest and he was sold. and Breakfast in Bed (this made me fall in love with the book!) plus several other categories. The cookbook is also written in a way that is entertaining for men. Information is broken down into terms and tones men understand. In the beginning of the book there are 25 tenets for stress free entertaining – directed at men. The first tenet is: “You have to plan. A football coach does not go into game day without a plan and you shouldn’t have guests over without a game plan.” I think it’s genius to compare entertaining to sports – totally a guy thing. There are also tips for successfully entertaining a romantic interest or spouse. I think these are tips most guys could use and are usually too macho to ask. They can casually read through the book to get these tips without anyone knowing what they’re doing. That way their manliness is left intact. 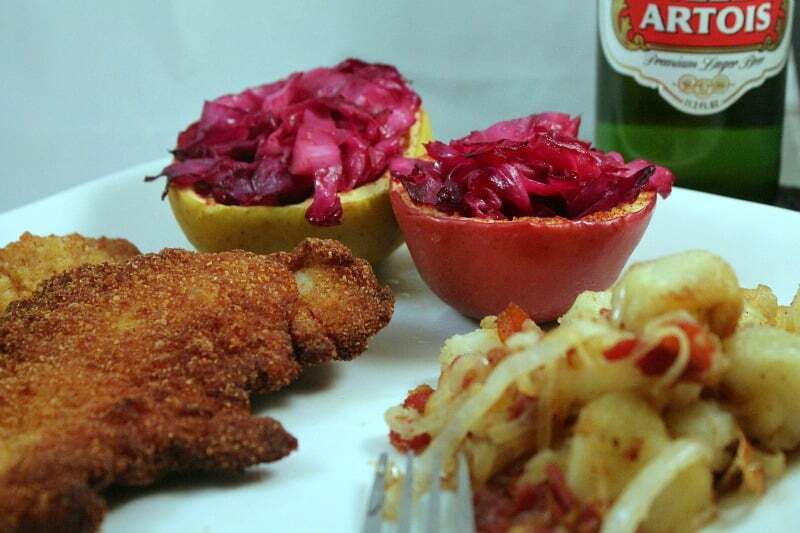 Of all the recipes in the book, John decided to make the Schnitzel and Baked Apples Stuffed with Red Cabbage first. He also made the accompanying Bratkartoffeln (fried potatoes laced with bacon and onions). The combination of his love for cabbage and the word Schnitzel drove this decision, I’m sure. He was also highly intrigued by the name, Bratkartoffeln. The directions were very detailed which made it foolproof. They even note the equipment needed to prepare the meal so advanced prep work is super simple. The only issue he ran into were the measurements. The directions called for a 2½ – 3 pound head of cabbage and 2 apples. He upped the number of apples to accommodate all the cabbage (there was a lot.) The end result was amazing as well, so this is a great cookbook for any man. If you’re eager to get the man in your life in the kitchen so you can take a break you need the Entertain Like a Gentleman Cookbook. It’s a fun read for men and makes the most intricate dishes easy to prepare. Find out more about this book on the Like a Gent website and pick up your copy today. Does your husband like to cook? Does he make kitchen masterpieces or disasters? Dislcosure: I received a copy of the Entertain Like a Gentleman Cookbook to review. All thoughts & opinions are my own.